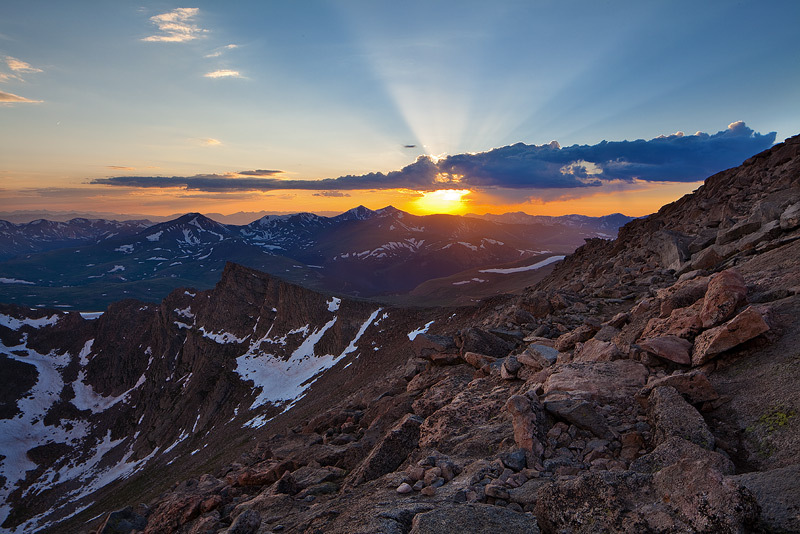 View from the edge of Sawtooth Ridge at sunset. 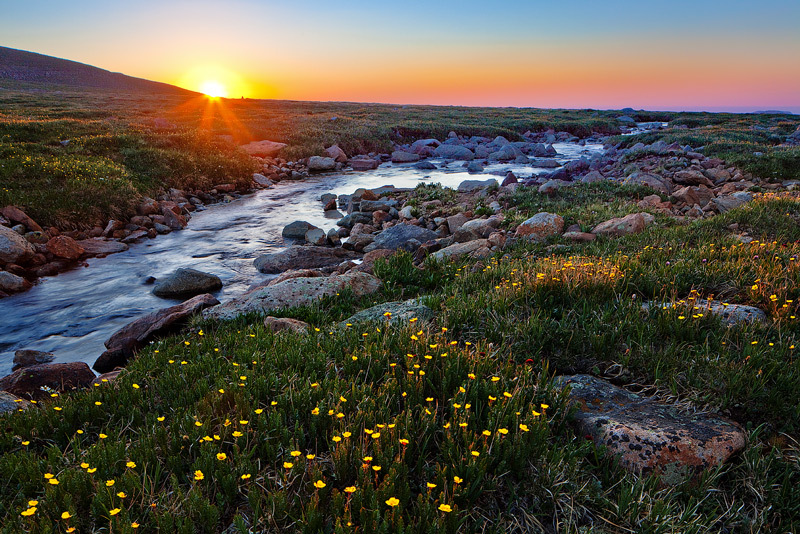 Every year in late June or early July, I make a trip up to Mount Evans for a sunrise-sunset shoot from the upper reaches of the mountain, which is one of the highest peaks in the state at 14,265 feet high. It’s a bit of a tradition. Shooting sunrise or sunset this time of year is a bit of a 50/50 proposition thanks to the monsoon. If the monsoon is active, sunset is usually a washout as storms surround the summit, often with lots of lightning. But the increase in storms can also bring more clouds for sunrise, whereas in a weaker monsoon, clear skies are almost a given for sunrise. I’ve had some success in past trips at sunrise, so this year I targeted a break in the monsoon for a chance at a nice sunset, which has eluded me in previous years. 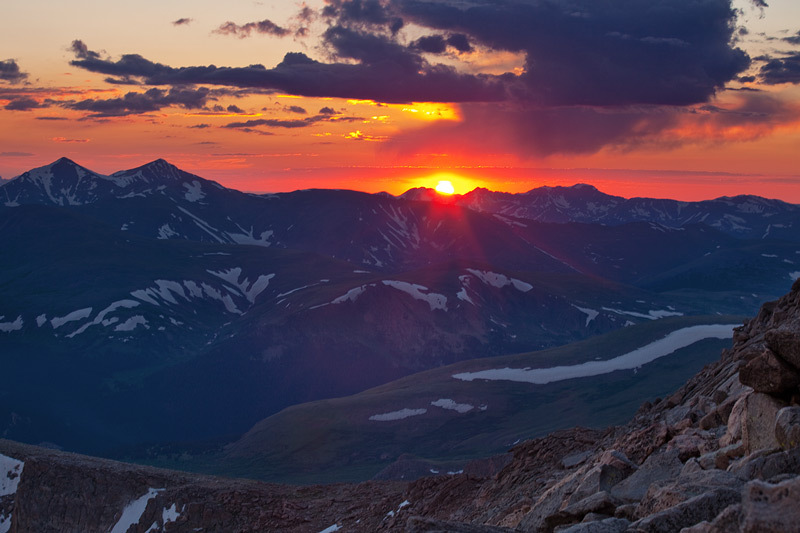 nearby Mount Bierstadt, another 14,000 foot peak, for sunset. I got out to the start of the Sawtooth, and it suddenly occurred to me how crazy it would be to have to scramble back through this field of talus and boulders in the dark, even with a headlamp to guide my way. There is some tricky exposed climbing in this area. So, I decided to backtrack to s higher point closer to the summit of Evans. I got back there just in time for a real nice sunset, complete with sun rays and a nice red glow! 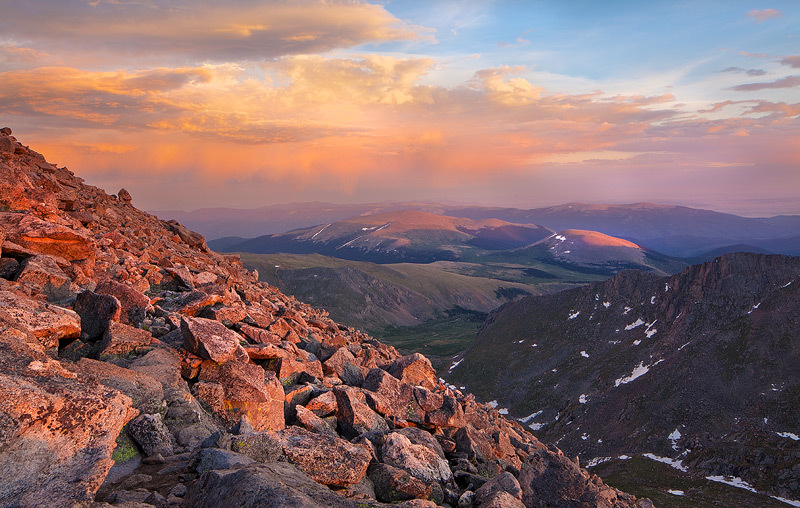 Panorama at sunset from near Mount Evans summit. The next morning, as expected, there was not a cloud in the sky. So, I needed to focus on shots that required minimal sky. I decided to hike down from Summit Lake on the Summit Lake trail. There were lots of little tarns along the way, and a nice stream cascading down the mountainside. 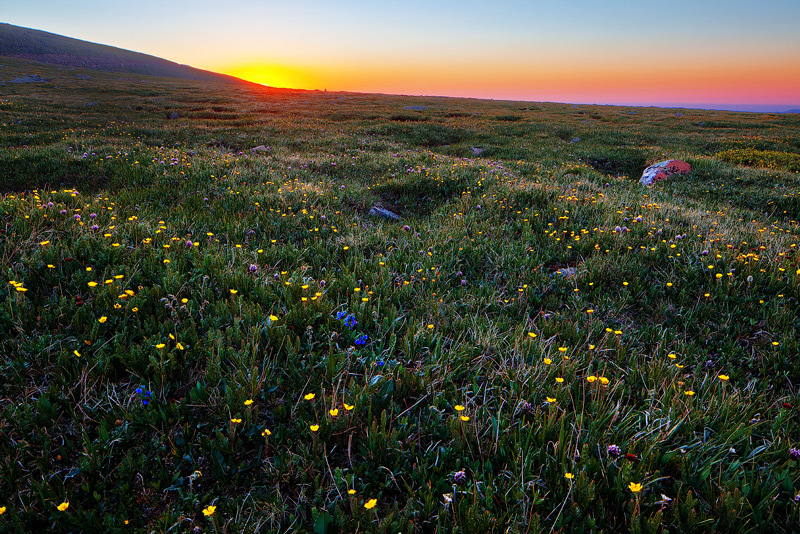 It was the perfect location for sunrise, and the wildflowers were pretty abundant. Outlet Stream from Summit Lake at sunrise. Beautiful meadow near Summit Lake at 12,000 feet. 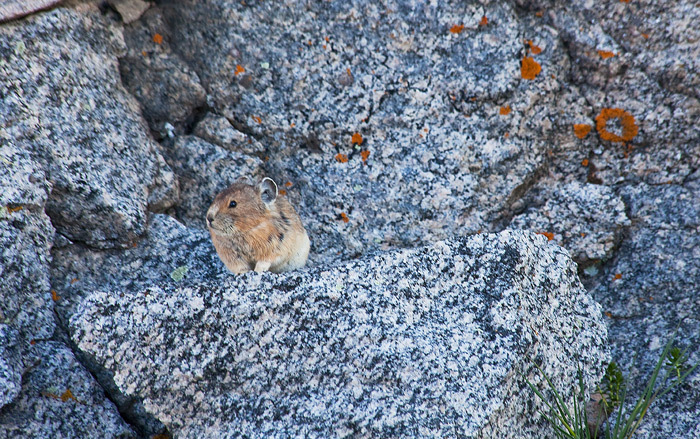 I headed back before the crowds of tourists descended on the summit. It was a great evening and morning to be out on the mountain! 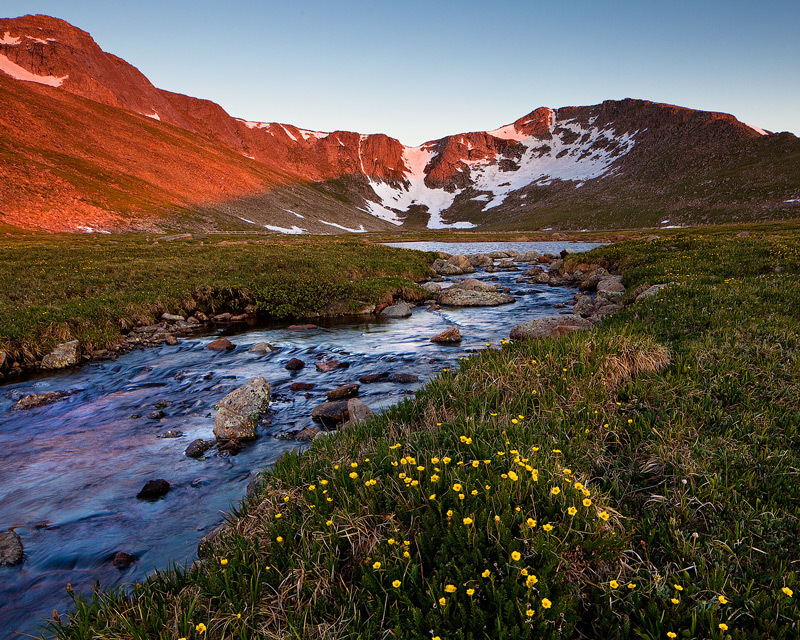 Mount Evans at sunrise from outlet stream of Summit Lake. I admire your energy in getting out at these times in a somewhat difficult environment, since I’ve been thinking of doing something similar all summer and just can’t quite get moving. These clear morning skies we get most of the summer in Colorado do limit the photo potential, you did a nice job of working with those conditions on your morning shots.